The Kremlin fired a diplomatic shot across Ottawa’s bow Thursday, warning that the adoption of a Canadian version of a U.S. law that imposes financial sanctions and travel bans on high-ranking Russian officials will cause serious damage in relations between the two countries. The Kremlin fired a diplomatic shot across Ottawa's bow Thursday, warning that the adoption of a Canadian version of a U.S. law that imposes financial sanctions and travel bans on high-ranking Russian officials will cause serious damage in relations between the two countries. 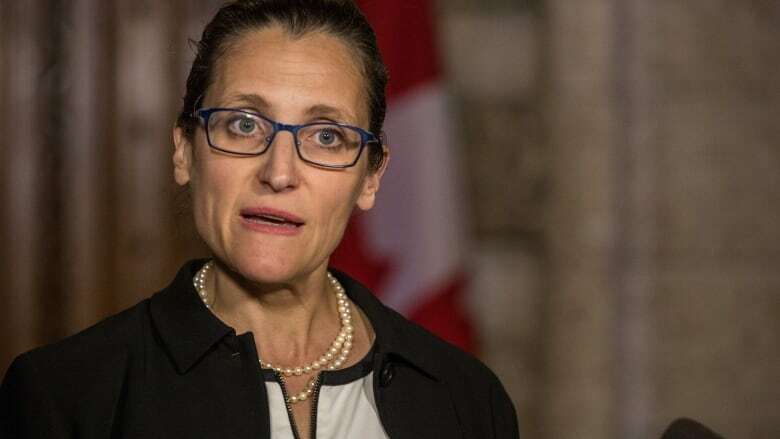 The stark diplomatic warning comes after Foreign Affairs Minister Chrystia Freeland said Wednesday that the government has agreed to create a so-called Magnitsky Act that would expand Canada's international sanctions law to target gross human rights violators. "We are compelled to warn the official Ottawa that we view its active support of the Canadian version of the American 'Magnitsky Act,' which contains contrived human rights claims against Russia, as another blatantly unfriendly step," the Russian Ministry of Foreign Affairs said in a statement. "If the Canadian Parliament approves this sanctions legislation, the relations between our countries, which are already experiencing difficult times, will suffer significant damage." It would be Canada's loss if "instead of developing mutually beneficial cooperation, including in the economic sphere and the development of the Arctic," Ottawa follows the path of "self-isolation" from Russia, the statement warned. The House of Commons foreign affairs committee agreed last month to support amending Canada's sanctions regime to include the rights violators "in honour" of the Russian whistleblower Sergei Magnitsky. Magnitsky died in pre-trial detention in a Moscow jail in 2009 after accusing high-ranking officials of a $230-million tax fraud. In late 2012, the United States adopted the so-called Magnitsky Act, which imposes travel bans and financial sanctions on Russian officials and other individuals believed to have been involved in Magnistky's death. Russia responded with its own blacklist of U.S. officials. Freeland and 12 other Canadian politicians and activists are also on the Kremlin's blacklist and have been barred from entering Russia because of their staunch criticism of Russian actions in Ukraine and its annexation of Crimea.